Mugshots Grill & Bar holds soft opening charity event in Malbis, AL to kick off the weekend with good food, a good time, and an opportunity to give back. It’s very humbling to know we are bringing hope to families and children in need. 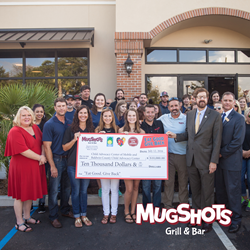 Good food, "Havin' A Good Time", and Giving Back is at the core of Mugshots Grill & Bar’s culture. Located at 29740 Urgent Care Drive, just yards south of the Highway 181 and Interstate 10 intersection, the 7th location to the Mugshots brand in Alabama opened its doors for business on Tuesday, July 12th. After hosting their "Eat Good, Give Back" soft opening fund raising event the weekend before, Mugshots Grill & Bar and their nonprofit, Making Life Grand, were able to raise funds and awareness for the Child Advocacy Center of Mobile and the Baldwin County Child Advocacy Center and their dedication to assisting families and children. “Being a part of the Mugshots Malbis opening was a great experience. The overwhelming support we received from the the people of Malbis, Daphne, Spanish Fort, and Mobile really tells you about the sense of community here.” said Sam McAlister, Marketing Director for Ain’t Life Grand Investments. “We have helped our communities with quite a few fund raising events over the years with our “Eat Good, Give Back” events and we just reached a milestone of $130,000 in donations to great organizations in 3 states. It’s very humbling to know we are bringing hope to families and children in need.” said McAlister in closing. Tuesday morning during the opening day ribbon cutting ceremony Mugshots founders presented a check to the Child Advocacy Center of Mobile and the Baldwin County Child Advocacy Center in the amount of $10,000.00. “Our Franchisee and Owner, George Herring, is a very driven, goal oriented leader that has done a terrific job with Mugshots Mobile.” said Founder of Mugshots Grill & Bar, Chris McDonald. “It’s exciting to think about what he will do, alongside his great management team, here in Malbis. With this opening we add an additional 100 team members to our Mugshots and Ain’t Life Grand family. We have over 1,200 family members now and our goal is to spread our culture to thousands of customers every day in over 20 grand restaurants.” said McDonald in closing. Mugshots Grill & Bar is one of the South's favorite restaurant concepts serving up great food in a fun, casual, and family-friendly atmosphere. We are dedicated to giving back to the communities in which we operate with our nonprofit organization "Making Life Grand." We pride ourself on our "Havin' A Good Time" culture and now have 16 locations in Louisiana, Mississippi, and Alabama.